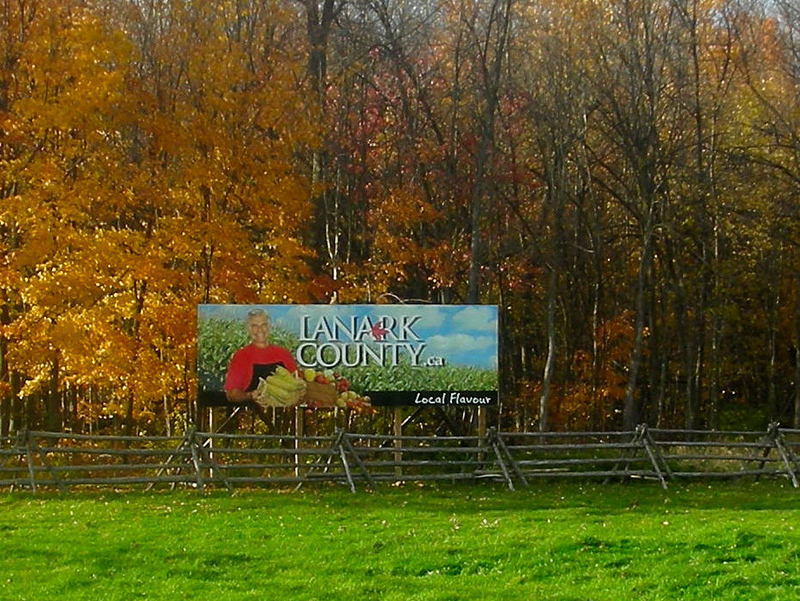 As you drive down Highway 7, just past Carleton Place on the way to Perth, you’ll spot a big sign off to the side of the road telling you that you’re in Lanark County. If anyone grew up in this area or has lived around there for any length of time, you might think that the sign, although very well done, might not really be necessary. Is there any doubt in your mind this time of year when a kaleidoscope colour awaits you around every turn in the road that you are in Lanark County? Although the billboard on the roadside confirms it to those who may be new to these highways and this colour-saturated landscape, those of us who grew up here are more than familiar with our brightest season. When we drive past this sign any other time of year it seems bright and lively welcoming us to the county; but viewing the same sign in the autumn it pales in comparison to nature’s own display that surrounds it from every angle. I guess it’s inevitable that these brilliant hues of fall are brighter still in Lanark County and we are reminded of the reason that the county is known around the world for their maple products. The sunny yellows, rich oranges and dazzling reds harken us back to thoughts of the spring harvest of syrup and taffy on the snow and creamy maple fudge. The rich heritage and traditions of local maple syrup producers goes back to the earliest days when the sap was harvested in simple buckets using teams of horses. Some of us remember the old sugar camps set way back in the snowy bush, where the scents of the sap being boiled into syrup seemed to saturate the spring air around us. It is this time of year, the autumn in Lanark County, when the leaves of the maple trees are showing off their brightest hues that reassures me that although the long cold winter looms ahead, that the spring and its bountiful maple harvest won’t be far behind. I always recall, when I see that bright sign welcoming travellers to the county, that those of us who grew up there need no other sign than the rich display of colour of the maple trees to remind us that we’re home. This entry was posted in Short Stories and tagged Arlene Stafford-Wilson, lanark county.